06/25/2018 Jerry was professional, fun to work with and the food was amazing! 06/25/2018 Food truck, went smooth, good food, fast service. 06/24/2018 The food was excellent & the staff was equally as exceptional! The whole team made the process easy and seamless! Scott and his team were great to work with! 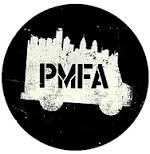 We will definitely be calling on them for future events & would highly recommend their catering services! 06/20/2018 Today's Company BBQ went on without a hitch! The staff was very helpful and pleasant. The salads were amazing.. i will say that some people said their hot dogs and hamburgers were cold but i'm thinking that the breeze blowing may have blown out the sterno... but all in all, it was a great experience and we will be using you guys again next year :) thank you again! 06/19/2018 Food was great. Service was prompt and thorough. I wish I tried everything! Would definitely use Jerry’s again. Scott is great to work with! 06/18/2018 Our entire experience with Jerry's was wonderful. The food was delicious, your staff was very accommodating and professional, and your billing process was extremely easy to use. You have developed a good business from beginning to end. Thank you!! 06/18/2018 Fantastic experience. Food was great and the chefs were very professional. Everyone at the party thought it was a great idea to have a food truck cater your party. 06/14/2018 This is a terrific way to host a causal party. We used Jerry's for our twin's graduation party in our back yard. Our guests loved the food and the different options. I'm giving you four out of five stars only because you ran out of one of the vegan and gluten free food option that we selected. Everybody loved the falafel bowl! 06/12/2018 The food was good. Everyone enjoyed it. The truck was a bit late, but we think it might have been the traffic. We will recommend your truck to others. 06/12/2018 The bartender was amazing, the food was delicious, you can’t go wrong with this group!! 06/12/2018 Awesome food, awesome staff, awesome experience!! 06/11/2018 We were so happy from start to finish to have Jerry's KitchenFood Truck at our daughter's graduation party. Scott was so easy to deal with and responded to every question immediatley! The servers were so nice and prepared everything meticulously. So many of my guests raved not only about the quality and taste of the food but that each dish was prepared hand done and presented so nicely. We will definitely use them again and would recommend them to others!! Thanks so much!! 06/11/2018 Always a great experience. Hot, delicious food cooked fast. A company favorite with our employees! Jerry's always responds quickly and offers great service. Thank you! 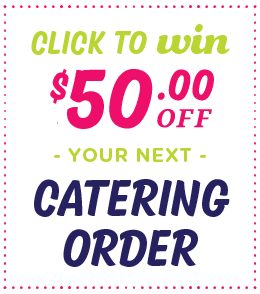 06/10/2018 If you are thinking about having a food truck for your party, DO IT! It was the easiest party that I ever hosted. The food was great and everyone loved ordering from the truck. The guys working the truck were super friendly and played cool music. The food truck was a hit with the graduating seniors and with the senior citizens! 06/10/2018 Fabulous! Fabulous! Fabulous! From initial contact and preparations through timely arrival of the genial crew to the delicious and inventive menu, you made my party of 70 adults and children perfect. I hosted in complete confidence that I could enjoy the party, as well! My guests congratulated me over and over for having Jerry's Kitchen. All raved about the food quality, the deliciousness and variety. I can't thank you enough for making this party memorable and a huge success. 06/10/2018 Chef Rob and his assistants were on time to get all the food ready (4 entrees plus 3 side dishes) for our grad party. Our friends & family said they had favorites but overall, the food was very good and enjoyed by all. I had a chicken sandwich and the chicken was moist and tender. Mac & cheese was creamy. My son loved the peppers & onions. Very satisfied with the quality of the food, and the service was top-notch. Would hire Jerry's Kitchen again. Thank you! 06/08/2018 Wonderful food and service. 06/08/2018 Food was excellent, delivery was on time and setup was perfect! Amazing people, food, and service! I highly recommend Jerry's! 06/05/2018 Great service and great food! 06/04/2018 .Easy booking process .Flexible with last minute changes regarding number of guest .On time and polite employees . Food was great! I will use jerry's kitchen again. My guest were very pleased. 06/04/2018 Jerry's Kitchen Food Truck is amazing. The menu offers plenty of options, all of which are spectacular. Just as important, the food truck staff was a great crew from start to finish. Ted and his team were friendly, outgoing, and exhibited excellent customer service throughout the afternoon. I highly recommend Jerry's Kitchen Food Truck to anyone looking to liven up their party menu. 05/21/2018 Jerry's Kitchen provided excellent food truck catering for our company event. The food was great, the service professional, and having a food truck made the event really fun. Jerry's Kitchen was a pleasure to deal with. 05/19/2018 Worked out great! Communication was easy and convenient. Food was great! Everyone loved it!!!! 05/18/2018 Everything was great! Thank you so much! 05/10/2018 Food was great! Everyone loved the experience of having a food truck parked in the driveway! 05/06/2018 You guys were great! Your staff was very friendly, on-time, and accommodating. I would definitely recommend you to anyone. 04/30/2018 On time and super friendly to work with. Delicious food --- especially those fries!!! Yum! 04/24/2018 The communication throughout the process of catering was so wonderful! Scott was readily available for any changes or updates. Someone always answered whenever we called with questions. Everyone was polite and gracious. The delivery was successful and on time. One feedback I would have is that I'd love to have confirmation of numbers of orders at delivery. We forgot ourselves to count how many boxes we received, and then felt like we were few some, but it was too late to confirm. Great job! 04/23/2018 This was perfect for our corporate event. We hired Jerry's Kitchen to provide a food truck lunch for our team of 60 people and it could not have gone better. Service was quick and the food was delicious. Our team loved it. Scott was very responsive and accommodating, and the team that ran the truck during our event was quick, courteous, and arrived on time. We would definitely hire Jerry's Kitchen again! 04/19/2018 Food and service was wonderful! Responses to my questions were always prompt and thorough and on the day of service they arrived on time and ready to go. Everything was great - no complaints! 04/02/2018 Jerry's Kitchen was such a hit. We decided on bringing a food truck to the grand opening of our new office and everyone loved every item on the menu. Scott was super responsive and helpful with finalizing the details on such short notice. Service was fast and the food was great. Would absolutely recommend to anyone looking for a great experience. 03/15/2018 Fantastic service! Easy to work with from start to finish and very friendly! Arrived promptly to set up and provided delicious food! Would definitely work with Jerry's Kitchen again for future events! Thank you! 02/21/2018 Absolutely perfect, timely, organized, and excellent. Thank you, Jerry's Kitchen, for feeding the new CAMBRiA Hotel & Suites team! 02/16/2018 Thank you for your great service! Everyone really enjoyed the food (more than a typical event at our school for lunch) and several people asked where the food was from so I'll share your business with them. There was more than enough food and the delivery was a little early which was perfect. Thank you again! Will definitely use again in the future. Also, really easy to communicate with them. 02/11/2018 The staff did a wonderful job. They anticipated needs, were efficient and super nice to us, our children, and our guests. We will be using them again! 02/09/2018 We had Jerr’y’s Kitchen for the Super Bowl. The food was amazing!!!! Can’t wait to use them again. 01/05/2018 Awesome!! These guys catered my outdoor wedding in zero degree weather and the food was amazing and kept everyone smiling! The food truck Is beautiful and was just what I wanted! 01/03/2018 The Food was awesome, everyone loved the food. The only reason I didn't give 5 stars which was probably my fault, due to miscommunication and last minute on my end, the food came out of the food truck as oppose to being set up on the buffet tables with warmers, but it was no big deal, food was still hot and delicious. I would definitely use them again, see you in two yes for graduation party!!! 12/11/2017 Excellent cheesesteaks and extremely professional! 12/11/2017 I was in an absolute pinch for catering an event and came across Jerry's Kitchen online. They responded right away and came to the rescue! Everyone attending our event LOVED the food and they were so so so wonderful to work with! I cannot recommend them enough! Thank you all at Jerry's, you have no idea how much we appreciate you! 12/04/2017 The team arrived on time, made no mess, and served incredible food. Will be using Jerry's Kitchen again for company and personal events. 11/20/2017 All our guests loved Jerry's Kitchen. They provided excellent service and were very courteous to our guests. We would recommend Jerry's Kitchen! Jerry was professional, fun to work with and the food was amazing! Food truck, went smooth, good food, fast service. The food was excellent & the staff was equally as exceptional! The whole team made the process easy and seamless! Scott and his team were great to work with! We will definitely be calling on them for future events & would highly recommend their catering services! Today's Company BBQ went on without a hitch! The staff was very helpful and pleasant. The salads were amazing.. i will say that some people said their hot dogs and hamburgers were cold but i'm thinking that the breeze blowing may have blown out the sterno... but all in all, it was a great experience and we will be using you guys again next year :) thank you again! Food was great. Service was prompt and thorough. I wish I tried everything! Would definitely use Jerry’s again. Scott is great to work with! Our entire experience with Jerry's was wonderful. The food was delicious, your staff was very accommodating and professional, and your billing process was extremely easy to use. You have developed a good business from beginning to end. Thank you!! Fantastic experience. Food was great and the chefs were very professional. Everyone at the party thought it was a great idea to have a food truck cater your party. This is a terrific way to host a causal party. We used Jerry's for our twin's graduation party in our back yard. Our guests loved the food and the different options. I'm giving you four out of five stars only because you ran out of one of the vegan and gluten free food option that we selected. Everybody loved the falafel bowl! The food was good. Everyone enjoyed it. The truck was a bit late, but we think it might have been the traffic. We will recommend your truck to others. The bartender was amazing, the food was delicious, you can’t go wrong with this group!! Awesome food, awesome staff, awesome experience!! 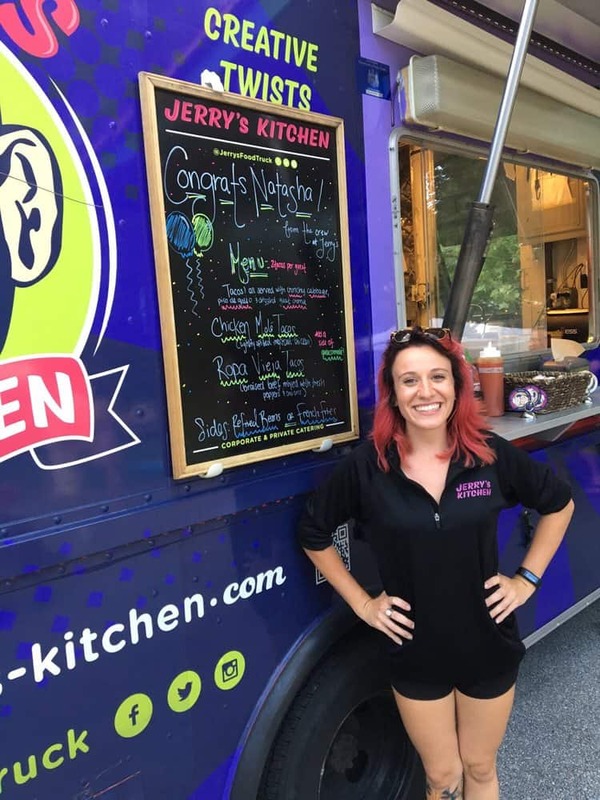 We were so happy from start to finish to have Jerry's KitchenFood Truck at our daughter's graduation party. Scott was so easy to deal with and responded to every question immediatley! The servers were so nice and prepared everything meticulously. So many of my guests raved not only about the quality and taste of the food but that each dish was prepared hand done and presented so nicely. We will definitely use them again and would recommend them to others!! Thanks so much!! Always a great experience. Hot, delicious food cooked fast. A company favorite with our employees! Jerry's always responds quickly and offers great service. Thank you! If you are thinking about having a food truck for your party, DO IT! It was the easiest party that I ever hosted. The food was great and everyone loved ordering from the truck. The guys working the truck were super friendly and played cool music. The food truck was a hit with the graduating seniors and with the senior citizens! Fabulous! Fabulous! Fabulous! From initial contact and preparations through timely arrival of the genial crew to the delicious and inventive menu, you made my party of 70 adults and children perfect. I hosted in complete confidence that I could enjoy the party, as well! My guests congratulated me over and over for having Jerry's Kitchen. All raved about the food quality, the deliciousness and variety. I can't thank you enough for making this party memorable and a huge success. Chef Rob and his assistants were on time to get all the food ready (4 entrees plus 3 side dishes) for our grad party. Our friends & family said they had favorites but overall, the food was very good and enjoyed by all. I had a chicken sandwich and the chicken was moist and tender. Mac & cheese was creamy. My son loved the peppers & onions. Very satisfied with the quality of the food, and the service was top-notch. Would hire Jerry's Kitchen again. Thank you! Food was excellent, delivery was on time and setup was perfect! Amazing people, food, and service! I highly recommend Jerry's! .Easy booking process .Flexible with last minute changes regarding number of guest .On time and polite employees . Food was great! I will use jerry's kitchen again. My guest were very pleased. Jerry's Kitchen Food Truck is amazing. The menu offers plenty of options, all of which are spectacular. Just as important, the food truck staff was a great crew from start to finish. Ted and his team were friendly, outgoing, and exhibited excellent customer service throughout the afternoon. I highly recommend Jerry's Kitchen Food Truck to anyone looking to liven up their party menu. Jerry's Kitchen provided excellent food truck catering for our company event. The food was great, the service professional, and having a food truck made the event really fun. Jerry's Kitchen was a pleasure to deal with. Worked out great! Communication was easy and convenient. Food was great! Everyone loved it!!!! Everything was great! Thank you so much! Food was great! Everyone loved the experience of having a food truck parked in the driveway! You guys were great! Your staff was very friendly, on-time, and accommodating. I would definitely recommend you to anyone. On time and super friendly to work with. Delicious food --- especially those fries!!! Yum! The communication throughout the process of catering was so wonderful! Scott was readily available for any changes or updates. Someone always answered whenever we called with questions. Everyone was polite and gracious. The delivery was successful and on time. One feedback I would have is that I'd love to have confirmation of numbers of orders at delivery. We forgot ourselves to count how many boxes we received, and then felt like we were few some, but it was too late to confirm. Great job! This was perfect for our corporate event. We hired Jerry's Kitchen to provide a food truck lunch for our team of 60 people and it could not have gone better. Service was quick and the food was delicious. Our team loved it. Scott was very responsive and accommodating, and the team that ran the truck during our event was quick, courteous, and arrived on time. We would definitely hire Jerry's Kitchen again! Food and service was wonderful! Responses to my questions were always prompt and thorough and on the day of service they arrived on time and ready to go. Everything was great - no complaints! Jerry's Kitchen was such a hit. We decided on bringing a food truck to the grand opening of our new office and everyone loved every item on the menu. Scott was super responsive and helpful with finalizing the details on such short notice. Service was fast and the food was great. Would absolutely recommend to anyone looking for a great experience. Fantastic service! Easy to work with from start to finish and very friendly! Arrived promptly to set up and provided delicious food! Would definitely work with Jerry's Kitchen again for future events! Thank you! Absolutely perfect, timely, organized, and excellent. Thank you, Jerry's Kitchen, for feeding the new CAMBRiA Hotel & Suites team! Thank you for your great service! Everyone really enjoyed the food (more than a typical event at our school for lunch) and several people asked where the food was from so I'll share your business with them. There was more than enough food and the delivery was a little early which was perfect. Thank you again! Will definitely use again in the future. Also, really easy to communicate with them. The staff did a wonderful job. They anticipated needs, were efficient and super nice to us, our children, and our guests. We will be using them again! We had Jerr’y’s Kitchen for the Super Bowl. The food was amazing!!!! Can’t wait to use them again. Awesome!! These guys catered my outdoor wedding in zero degree weather and the food was amazing and kept everyone smiling! The food truck Is beautiful and was just what I wanted! The Food was awesome, everyone loved the food. The only reason I didn't give 5 stars which was probably my fault, due to miscommunication and last minute on my end, the food came out of the food truck as oppose to being set up on the buffet tables with warmers, but it was no big deal, food was still hot and delicious. I would definitely use them again, see you in two yes for graduation party!!! Excellent cheesesteaks and extremely professional! 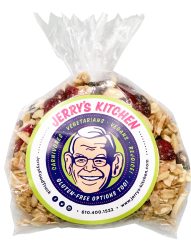 I was in an absolute pinch for catering an event and came across Jerry's Kitchen online. They responded right away and came to the rescue! Everyone attending our event LOVED the food and they were so so so wonderful to work with! I cannot recommend them enough! Thank you all at Jerry's, you have no idea how much we appreciate you! The team arrived on time, made no mess, and served incredible food. Will be using Jerry's Kitchen again for company and personal events. All our guests loved Jerry's Kitchen. They provided excellent service and were very courteous to our guests. We would recommend Jerry's Kitchen!